Due to it's tropical island remoteness, arriving to Koh Pu involves a simple but fun transfer from your ferry to a Thai longtail boat, which gently motors up to the soft sands of the Koh Pu beach. boarding the longtail boat is not difficult due to good staff support. Getting off the longtail boat on the beach side is also quite simple - though be prepared to get your ankles wet and protect your belongings from dropping into the shallow waters. Please be informed that if you are staying on Koh Pu, your hotel is likely to arrange your longtail boat pick up from the ferry. We recommend that if you are staying on Koh Pu, you will also On the north side likely get a complimentary longtail boat transfer from your accommodation to the ferry that will take you from Koh Pu to your next destination. As ferry transfer is the only way to travel in and out of Koh Pu, all the hotels know the transfer routine. 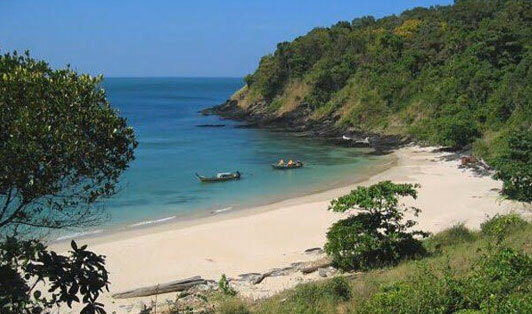 地址 : Northern beach of Koh Jum Island.